Vehicles of this model are Szczecin # 603 & # 604. 35T is currently on show at InnoTrans Berlin an will be delivered to Chemnitz (Germany) later this year. Please rename the Brest depot "Morden Tramway" to "Modern tramway"
The city of Sétif (Algeria) inaugurated their first tram line on 08.05.2018. -> status active. In the city of Ouargla (Algeria) inaugurated the tram line on 20.03.2018. -> status active. 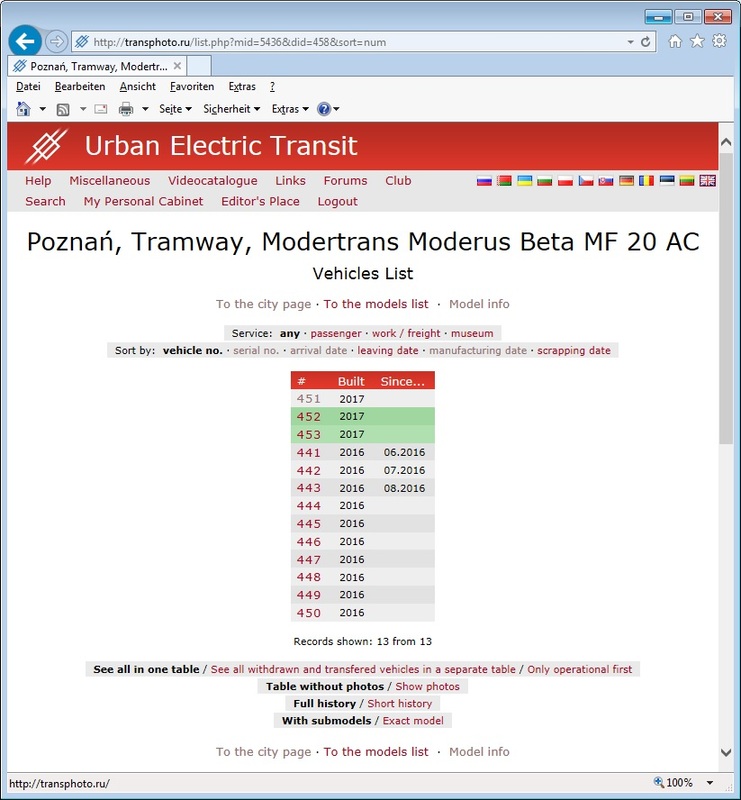 Add "Alstom Citadis 502" please. They have been delivered to Dublin (Ireland) since November 2017. Changes have been done. What is the correct name for Canberra tram system operator? from "Historischer Straßenbahnhof Leipzig-Möckern" to "Leipziger Verkehrsbetriebe". Are they all already in operation? The city of Luxembourg needs some editing. Please use "Heaton Park Tramway" as title, not "Museum" or "Tramway Museum". Тема: Sort by: vehicle no. Re: Sort by: vehicle no. Please change "Bombardier MGT6DE" to "DWA MGT6DE". The 12 tramcars for Erfurt model "MGT6DE" were built 1996 - 1998 by "DWA (Deutsche Waggonbau AG - Werk Bautzen)". DWA was sold to Bombardier in 1998.